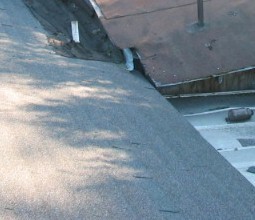 Roofing Quiz - How many things are wrong with this picture? This first photo shows shingles installed from top to bottom (see left side). 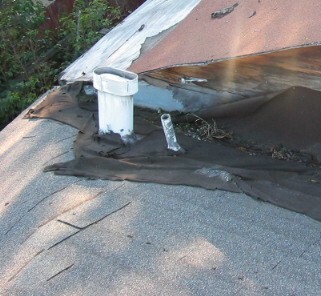 Whereas a roof ordinarily "sheds" water, this one "collects" it and dumps it inside the house. 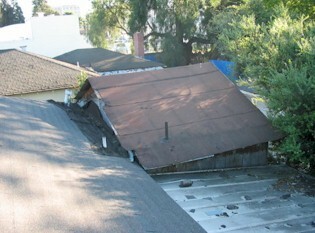 Sometimes the shingle tabs go up (the correct way), and sometimes they go down (the wrong way). But wait - there's more. What's up with the addition on the upper part of the photo? Ever wonder what would happen if you framed in a roof addition without a gable connecting it to the main building like was done with the one to the left? Your own personal indoor waterfall... This is the view inside the addition, looking at the back of the house. 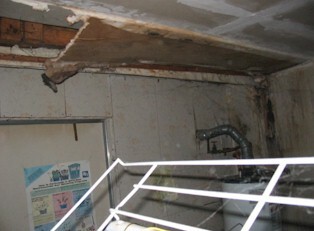 The joint between the addition and the house is the section with the ceiling drywall removed. The roof the the house sheds water which dumps continuously across the full width of the addition. We will be extending the framing of the addition to the main house, and then adding valley flashing to shed water off the roof.